The #1 ranked Fishburne Military School (Waynesboro, VA) golf team (4-0) took on the #2 ranked Kenston Forest School (Blackstone, VA) yesterday at the Waynesboro Country Club. The Caissons rolled on to get the victory winning 174-192. Low medalist was Nick Fedchock firing a 2 over 38. Fishburne Military School combo guard James Rucker (6’4’, 185, Knightdale, N.C.) has committed to Division II power Mount Olive (N.C.). Rucker announced the commitment on Saturday. College acceptance letters at Fishburne Military School are beginning to pile up…Leading the charge for the Caissons is Battalion Commander Harrold McCoo, who has now been accepted to BOTH West Point and the Naval Academy. The Fishburne Military School Caissons golf (3-0) team rolled to an impressive win over the former State champion Covenant (Charlottesville, VA) golf squad. Team scores were Fishburne 161, Covenant 202. Fishburne was led by freshman Matthew Manos, firing a low score of 39. The Fishburne Military School lacrosse squad earned its first win of the season with a 9-1 win on the road over the Miller School Mavericks. Senior Joseph Canna started the scoring and led the team with 2 goals, 2 assists, and 3 hits. 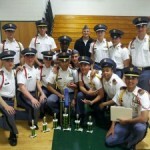 Fishburne Military School’s JROTC Drill and Academic Teams continued to make a name for themselves in 4th Brigade as they travelled to Buckingham, Virginia on Saturday to compete in the Buckingham Drill Meet. 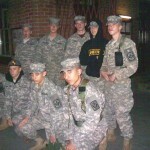 The Caissons brought home 7 trophies. 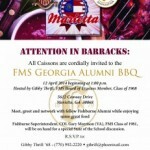 Join host Gibby Thrift, FMS Trustee and Class of 1968, for the FMS GEORGIA ALUMNI BBQ. 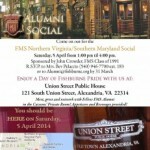 The festivities will begin at 1:00 p.m.
Meet, greet and network with Fellow FMS Alumni in the Caissons’ own Private Room at Union Street Public House in Alexandria! Appetizers and Beverages provided! On Monday, the Caissons took on TCS at Poplar Grove Golf Course in Lynchburg. The team came out strong, beating a tough opponent 162-175. Collin Wade was the low-score medalist shooting a round of 38. The top four players were Wade, Nick Fedchock (39), Matthew Manos (42) and Jake Cochran (43). Also contributing were Reid D’Amico (44) and Hunter Couchot shooting a 47.